ALL SMILES: Brighouse Town Ladies football team collect the Amateur Female Team of the Year award at the Calderdale Sports Awards 2015 last Thursday, which were staged at The Venue, Barkisland. Rob Mitchell, manager, was joined on stage by assistant Colin Tomkins and ex-player Eleanor Ciesielski. Brighouse Town Ladies FC picked up the Amateur Female Team of the Year at the annual Halifax Courier Calderdale Sports Awards at the Venue at Barkisland, Halifax. A delighted Rob Mitchell, manager of the team, was joined on stage by his assistant Colin Tomkins and ex-player Eleanor Ciesielski, now at Manchester City Ladies, to receive the award sponsored by Yorkshire Timber. Mitchell said: “We were surprised to have been shortlisted for the award but to win it was really pleasing. Not only for myself and the coaching team but for the club. Ciesielski, who was shortlisted for Young Female of the Year, was only too pleased to support her former team on the night and said: “To be part of such a great team has given me the opportunity to develop and progress in the game. “With the help of Rob (Mitchell) and the rest of the team last season, I am now realising my dream at one of the biggest clubs in the world. “I would love to go back one day and play for Brighouse because they really are going places and do things very professionally. Town Ladies are in line for a major sponsorship from RRG of Leeds Road, Huddersfield, Toyota and Lexus dealers. On the pitch, Brighouse Town Ladies were rather disappointingly knocked out of the Ladies FA Cup just one game shy of the first round proper. Although playing a side one division higher, Town went in to the game full of confidence but failed to adapt to the very harsh and heavy conditions in Durham. Chester-le-Street played a very direct game, looking to play long at every opportunity, and a couple of mistakes and individual errors ultimately cost the local side, despite being on top for long periods. At 2-0 down Jodie Redgrave lashed in a 40-yard screamer to give her side hope. Once again on top and looking like winning the game, naive Town were hit on the break once more to make it 3-1 with just 10 minutes to go. Chester-le-Street then parked the bus and rode out the final stages of the game. 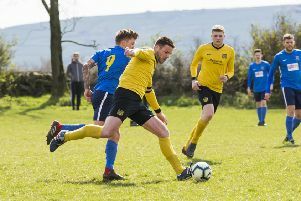 Manager Mitchell said it was a learning curve for the side and one which will hopefully spur Town Ladies on to complete their goal of achieving promotion to the Premier League.